LaBelle Tries On Jazz Hat To Troublesome Effect - TheUrbanMusicScene.com | Music Reviews! Patti LaBelle sits on a throne as among the greatest R&B to Pop singers recording and performing. However, the list of singers that can authentically swing between the Pop world and the Jazz world is a short one highlighted by Aretha Franklin, Patti Austin, Dee Dee Bridgewater, Nancy Wilson (retired) and the late incomparable Natalie Cole and Teena Marie. 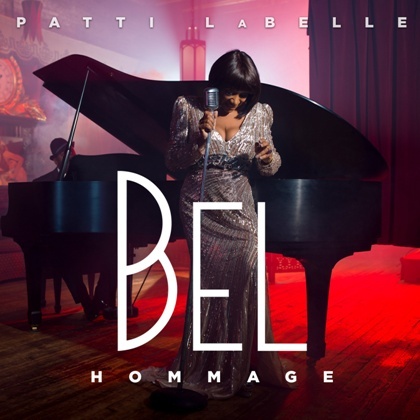 For LaBelle’s first album in over a decade, Bel Hommage, to be marketed as a “jazz” album does an unfortunate disservice in both directions. Because while roughly half of the 13-song album finds the lady singing couched in jazz arrangements, her approaches to the phrasing of this material and her delivery of the lines of the lyrics are not jazz. This makes assessing Bel Hommage a challenge. Though her voice is technically incomparable, she’s not singing jazz. Additionally, the song selection lacks cohesion and some of the arrangements are head-scratchers. For instance, “Go to Hell” – one of three songs strongly associated with Nina Simone that LaBelle tackles here – is a big band waltz that she smacks out of the park but more as a Broadway showstopper than a jazz slayer. It also includes a couple instances of self-done backing vocals which is a studio pop effect, not so much for jazz. The same goes for the album opener “Jazz in You” which she gives a show time belt until the bottom falls out in the middle with a meandering piano solo arriving where a horn screams to be. And what’s up with the dicey song ending fade? Most disappointing is the dashed possibility of a fine arrangement on the bedrock soul-jazz classic “Moanin’” originally penned by pianist Bobby Timmons in 1958 as an instrumental when he was a member of drummer Art Blakey’s legendary Jazz Messengers which recorded it as the title track of a now legendary Blue Note Records LP. So popular was this jukebox sensation that vocalese master Jon Hendricks immediately wrote lyrics to the melody and premiered them as a vocal on trio Lambert, Hendricks & Ross’ seminal LP, The Hottest New Group In Jazz (Columbia – 1959). Labelle producer Lamar Jones brought a novel modern blues arrangement to the table featuring electric guitar, organ, muted trumpet and co-signin’ brass only for Patti to undercut the vibe altogether. Compounded injury ensues when Patti basically answers her own failure in telegraphing the tune by coyly ad libbing at the end, “Moanin’…at least I used to be!” Memo: glad you have new love in your life but it provided you zip zero assistance with the delivery of this blues joint. One aches to hear how someone saucier such as Eartha Kitt might have clawed her way through it if God had given “Catwoman” a tenth life. Not surprisingly, LaBelle fares best on the strings-kissed ballads like “Softly As I Leave You,” a strong reading of “Here’s To Life” (all but owned by the late Shirley Horn) and “Till I Get It Right” (an evergreen in the country world by Tammy Wynette and a piece of cake for Patti). It’s on more nuanced material that requires a feel for jazz that she once again stumbles on “Folks On The Hill” (actual title “The Folks Who Live On The Hill”), “Wild is the Wind” (another Simone gem that Labelle almost nails until she puts a lil’ too much fancy on the closing), “Song For Old Lovers” and Billie Holiday’s self-penned 1944 scorcher “Don’t Explain.” A duet with special guest KEM on the iconic “Moody’s Mood” lacks chemistry though the gentleman is at least flowing in more of a jazzy mack balladeer style. In the final analysis, it seems that whenever LaBelle started down the path of crafting this album, the idea was to try on the hat of jazz. At some point, a bunch of ballads were added which would lean more in the realm of an American Standards set – “LaBelle with Strings” – or a lush torch song project such as the exquisitely produced ones that Gladys Knight (Before Me – Verve – 2006) and Carly Simon (Torch – Warner Bros. – 1981) crossed over and left lasting impressions with. From the evidence here, the latter would have been a better focused direction for the gifts with which Patti LaBelle is more naturally blessed.